At Aufhauser, you will always find a responsible partner with a personal interest in your business success. Silver brazing filler metals, phos-copper, copper based brazing and welding filler metals, aluminum, stainless steel, steel, cast iron and nickel-based filler metals, soldering fluxes. 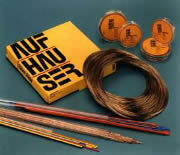 Strip, rod, wire, flux coated wires and rods, powder, paste, engineered rings and shapes. Welding distributors, government, military and defense, automotive, HVAC, aerospace, exploration and drilling, electrical/electronic, plumbing, mining and cutting tools.